The leukotriene B4 (LTB4) receptor (BLT1) becomes desensitized upon repeated agonist stimulation. Little is known, however, about BLT1 internalization, which follows desensitization in most G-protein-coupled receptors (GPCR). In the current study, transiently expressed BLT1 readily internalized, after LTB4 stimulation, in RBL-2H3 cells that express high levels of endogenous GPCR kinase 2 (GRK2) but did not in COS-7 or human embryonic kidney (HEK) 293 cells, which do not overexpress GRK. 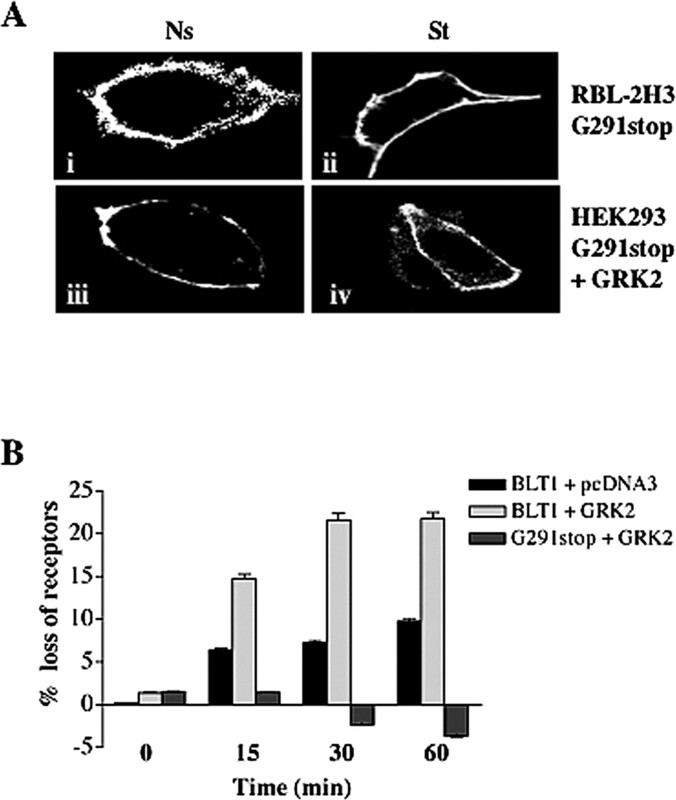 The internalization of BLT1 could be blocked in RBL-2H3 cells by coexpressing dominant-negative (DN) GRK2 K220R and could be promoted in HEK293 cells by coexpressing wild-type (WT) GRK2. Coexpression of WT or DN nonvisual arrestins had no effect on BLT1 internalization. Moreover, upon stimulation with LTB4, BLT1 did not induce arrestin-green fluorescence protein redistribution in either cell type, even in the presence of overexpressed GRK2. Coimmunoprecipitation experiments confirmed that BLT1 could associate with GRK2 but not with arrestins. A C-tail–truncated mutant of BLT1 lost the capacity to internalize and associate with GRK2 upon exposure to LTB4, suggesting that the C-tail was required for receptor internalization and association with GRK2. Taken together, our results indicate that the C terminus of BLT1 plays a pivotal role in receptor internalization and GRK2 association. 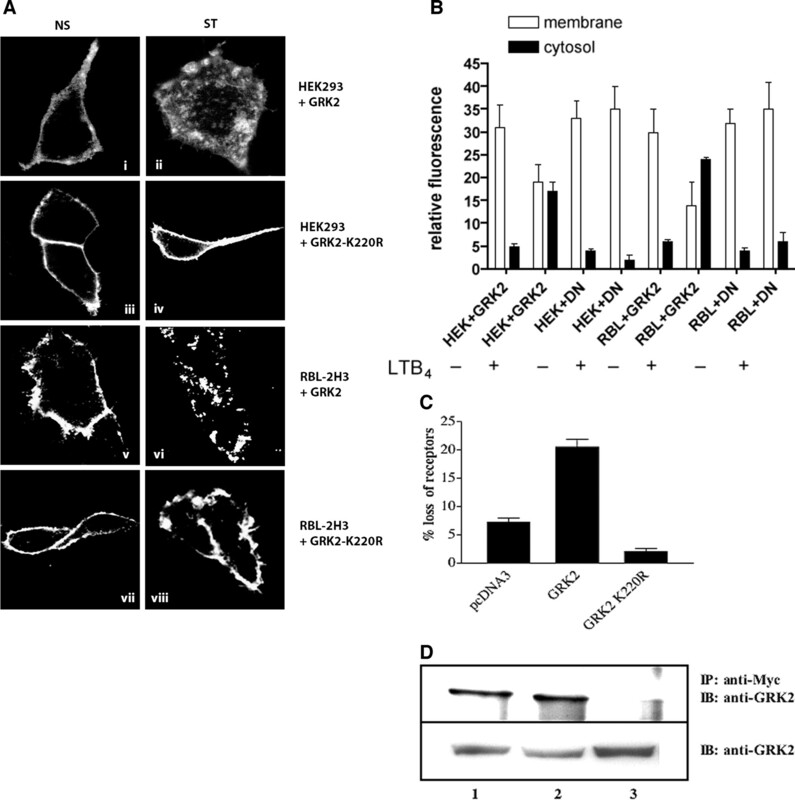 Moreover, ligand-induced BLT1 internalization is dependent on GRK2 but independent of arrestins. This may allow differential, cell-type–specific signaling in response to LTB4, depending on GRK expression levels. Cell responsiveness to agonists of GPCRs is usually characterized by a rapid desensitization to subsequent exposures, followed by a resensitization in the absence of stimulation. The mechanism of desensitization involves a series of distinct steps, including a functional uncoupling from G proteins, receptor internalization into the intracellular compartment, and receptor down-regulation. Among these steps, receptor internalization is believed to play an important role in both desensitization and resensitization of GPCRs (Yu et al., 1993). Studies with the β2-adrenergic receptor (β2-AR) have delineated a general pathway for agonist-mediated internalization in which agonist-induced activation of receptors leads to receptor phosphorylation by GRKs and/or second messenger-dependent kinases. GRKs are serine-threonine kinases that specifically recognize and phosphorylate intracytoplasmic residues of the agonist-occupied form of many GPCRs (Premont et al., 1995; Pitcher et al., 1998; Ferguson, 2001). Binding of arrestins to phosphorylated receptors (reviewed in Pitcher et al., 1998; Ferguson, 2001) physically uncouples the receptor from the G-protein and finally targets the phosphorylated GPCRs to clathrin-coated pits and initiates endocytosis. In this paradigm, it is believed that the role of GRKs is to facilitate arrestin binding to GPCRs and that the interactions of arrestins with clathrin (Goodman et al., 1996) and the AP-2 adaptor protein (Laporte et al., 2000) are essential for GPCR internalization. Leukotriene B4 (LTB4) is a potent lipid mediator of allergic and inflammatory reactions, as well as a modulator of immune responses (Rola-Pleszczynski and Stankova, 1992). It plays a crucial role in chemokinesis (Ford-Hutchinson et al., 1980) and chemotaxis (Palmblad et al., 1981) of neutrophilic polymorphonuclear leukocytes and in aggregation (Ford-Hutchinson et al., 1980), degranulation (Showell et al., 1982), cation fluxes (Molski et al., 1981), and binding of neutrophils to endothelial cells (Bray et al., 1981). The presence of high in vivo concentrations of LTB4 is associated with several diseases (Crooks and Stockley, 1998). LTB4 is rapidly synthesized by phagocytic cells, principally polymorphonuclear leukocytes (Borgeat and Samuelsson, 1979) and alveolar macrophages (Fels et al., 1982) upon challenge with a variety of stimuli, including LTB4 itself (McDonald et al., 1992). LTB4 exerts its activities through binding to and activation of specific receptors on the plasma membrane of target cells. Two types of LTB4 receptors have been described on human neutrophils (Goldman and Goetzl, 1984): Yokomizo and collaborators (Yokomizo et al., 1997) cloned and expressed a high-affinity human leukocyte LTB4 receptor (BLT1) and, more recently, a second, lower affinity receptor for LTB4 (BLT2) (Yokomizo et al., 2000). BLT2 has a broader ligand specificity for various eicosanoids (Yokomizo et al., 2001). Both receptors belong to the GPCR family, in a subfamily that includes receptors for chemokines and other chemotactic factors. In 1984, Goldman and Goetzl reported that leukocyte deactivation by prior exposure to LTB4 led to a loss of high-affinity binding sites. With both BLT receptors cloned, it became possible to investigate the molecular mechanisms involved in the agonist-induced BLT1 regulation, including disappearance of high affinity binding sites for LTB4. Therefore, we have recently demonstrated that BLT1 was rapidly desensitized upon exposure to LTB4 and that GRK6 and 2 were most likely implicated in the desensitization (Gaudreau et al., 2002). Structural determinants of the C-tail were found to be essential for GRK-mediated BLT1 desensitization. However, little is known about the molecular mechanisms involved in BLT1 internalization. The aim of this study was to elucidate whether BLT1 internalizes upon agonist stimulation and, if so, whether the regulatory elements, GRKs and nonvisual arrestins, play a role in its internalization. Our results indicated that BLT1 internalization was cell-type–dependent and required GRK2, but not nonvisual arrestins. Furthermore, the C-terminal segment of BLT1 was shown to play a role in receptor internalization and GRK2 association. Materials. Reagents were obtained from the following sources: all culture media, LipofectAMINE, and synthesized oligonucleotides were from Invitrogen (Burlington, ON, Canada); protease inhibitor cocktail tablets, Pwo polymerase, and FuGENE 6 transfection reagent were from Roche (Laval, QC, Canada); restriction endonucleases and modifier enzymes were from Promega (Madison, WI); ECL Western blotting detection reagent kit and myo-[3H]inositol were from Amersham Biosciences (Baie d'Urfé, QC, Canada); Dowex AG1-X8 column was from Bio-Rad (Hercules, CA); bovine serum albumin and protein A Sepharose were from Sigma-Aldrich (Oakville, ON, Canada); fetal bovine serum (FBS) was from BIO MEDIA Canada Inc., (Drummondville, QC, Canada); gentamicin sulfate was from Schering Canada Inc. (Pointe-Claire, QC, Canada); BCA protein assay kit was from Pierce (Rockford, IL); leukotriene B4 and platelet-activating factor were from Calbiochem (La Jolla, CA); anti-arrestin-2 antibody was from BD Transduction Laboratories (Lexington, KY); anti-Myc 9E10 hybridoma was from the American Type Culture Collection (Manassas, VA); fluorescein isothiocyanate- or rhodamine-conjugated goat anti-mouse antibody IgG was from Bio Can Scientific (Mississauga, ON, Canada); anti-GRK2 antibody was from Santa Cruz (Santa Cruz, CA); arrestin-2, arrestin-2 V53D, arrestin-2-GFP, arrestin-3, arrestin-3 V54D, and arrestin-3-GFP expression vectors and GRK2, -3, -5, and -6 as well as GRK2 K220R were kindly provided by Dr. J. Benovic (Jefferson University, Philadelphia, PA). BLT1 Constructs. BLT1-GFP and BLT1-291-GFP constructs were made by amplifying BLT1 cDNA without a stop codon by PCR using the forward primer 5′-CGGAATTCATGAACACTACATCTTCTGCA-3′ introduced into the EcoRI site and reverse primer 1, 5′-TCGGGATCCCGGTTCAGTTCGTTTAACTTGAG-3′ introduced into the BamHI site (for full-length BLT1) and reverse primer 2, 5′-GTAGGCCTCCGGCGCACGCGTAC-3′ introduced into the StuI site (for N-terminal amino acids 1 to 291 of BLT1). The PCR products were digested with corresponding restriction endonucleases and inserted into pEGFP-N1 (BD Biosciences Clontech, Palo Alto, CA) vector digested with EcoRI/BamHI or EcoRI/SmaI restriction enzymes. The Myc-tagged WT and G291stop mutant BLT1 were described previously (Chen et al., 2002). The integrity of constructs was confirmed by sequencing. Cell Culture and Transfection. COS-7 and human embryonic kidney (HEK) 293 cells were grown in Dulbecco's modified Eagle's medium (DMEM) high glucose supplemented with 10% FBS and 40 μg/ml gentamicin. For confocal microscopy, cells were seeded in six-well plates containing a coverslip at a density of 1 × 105 COS-7 cells/well and 2 × 105 HEK293 cells/well. Cells were transfected following the manufacturer's instructions using FuGENE 6 transfection reagent kit. We used 1 to 1.5 μg of DNA per well. For each 100-mm Petri dish (for coimmunoprecipitation), the total amount of DNA was 6 μg. Rat basophil leukemia (RBL)-2H3 cells (a kind gift of Dr. S. Bourgoin) were grown in minimum essential medium supplemented with 15% FBS and 40 μg/ml gentamicin and transfected with LipofectAMINE according to the manufacturer's instructions. Radioligand Binding Assay. For binding experiments, 2 μg of cDNA of each receptor were used to transfect 1.2× 106 COS-7 cells seeded in Petri dishes. Cells were harvested 48 h after transfection and washed twice in phosphate-buffered saline (PBS) and twice in HEPES-Tyrode's buffer (140 mM NaCl, 2.7 mM KCl, 1 mM CaCl2,12 mM NaHCO3, 5.6 mM d-glucose, 0.49 mM MgCl2, 0.37 NaH2PO4, and 25 mM HEPES, pH 7.4) containing 0.1% (w/v) bovine serum albumin, in which cells were also resuspended for the assay. Competition binding curves were carried out on 2 × 105 cells with 0.25 nM [3H]LTB4 and increasing concentrations of nonradioactive LTB4 for 2 h at 4°C. Free radioactivity was separated from cells by centrifugation and a double-wash with 1 ml of ice-cold HEPES-Tyrode's buffer. Cell-associated radioactivity was measured by liquid scintillation counting. Nonspecific binding represented less than 10% of total binding with 500 nM nonradioactive LTB4. Dissociation constants (Kd) were calculated from competition binding curves using Prism software version 3.0a (GraphPad Software, San Diego, CA). Confocal Microscopy. Confocal microscopy analysis was performed as described previously with some modifications (Chen et al., 2002). The cells were grown on coverslips (22 mm) for 40 h after transfection, treated with 100 nM LTB4 at 37°C for indicated times, and fixed with 3% paraformaldehyde (15 min at room temperature). The coverslips were then placed in 0.1% saponin in PBS for 20 min and then sequentially incubated with 5% dry milk and 0.01 M glycine at room temperature for 20 min each. The cells were then incubated with an anti-Myc monoclonal antibody, followed by rhodamine-conjugated goat anti-mouse IgG antibodies. For live cell visualization, cells grown on 22-mm coverslips were pretreated with 20 μg/ml of cycloheximide for 30 min to prevent new receptor synthesis, and the coverslip was then placed in a tissue culture chamber. The DMEM with cycloheximide, without FBS, was added, and the temperature was maintained at 37°C. LTB4 (100 nM) was added after the first image was taken. For live confocal microscopy, experiments were performed several times, whereas when using fixed samples, multiple cells in several fields were studied. The cells were analyzed on a Multi-Probe 2001 confocal argon laser scanning system (Amersham Biosciences) equipped with a Nikon Diaphot epifluorescence inverted microscope. Scanned images were transferred onto an Indy 4000 workstation (SGI, Mountain View, CA) equipped with Imagespace analysis software. Quantification of receptor internalization was performed on confocal images of ten cells per slide, using the ImageJ software (http://rsbweb.nih.gov/ij/) on a Macintosh G4 computer. Membrane and cytoplasmic areas were delineated using the freehand tool, and fluorescence intensity was measured, corrected for area, and expressed as relative fluorescence. Coimmunoprecipitation. Forty hours after transfection, cells grown on 100-mm dishes were washed twice with PBS and then treated with 100 nM LTB4 at 37°C for the indicated time, then lysed with 0.5 ml of radioimmunoprecipitation assay buffer (50 mM Tris, pH 7.5, 5 mM EDTA, 150 mM NaCl, 0.25% sodium deoxycholate, 1 mM sodium orthovanadate, 10 mM NaF, 1% Igepal, and protease inhibitor cocktail tablets). The lysate was solubilized by incubation at 4°C for 30 min, precleared with 50 μl of protein A-Sepharose beads at 4°C for 1 h, and clarified by centrifugation at 14,000 rpm for 30 min. The concentration of soluble protein was determined with the BCA protein assay kit. Equal amounts of protein were used for all subsequent immunoprecipitations. The precleared lysate was incubated with anti-Myc (9E10 hybridoma) overnight, then 50 μl of protein A-Sepharose beads was added and incubated for 4 h at 4°C. After extensive washing with radioimmunoprecipitation assay buffer, the immunoprecipitated proteins were eluted from the beads with 2× SDS sample buffer, resolved by SDS-PAGE, and then subjected to Western blot analysis. Flow Cytometry Studies. HEK293 grown at 80% confluence in Petri dishes were transfected with 2 μg of cDNA encoding WT or mutant BLT1 receptors and 4 μg of each, other cDNA or pcDNA3 expression vector DNA, as indicated in the figure legends. Twenty-four hours after transfection, HEK293 cells were transferred to six-well plates. Forty-eight hours after transfection, cells were stimulated, or not, with 300 nM LTB4. In some experiments, cells were pretreated for 20 min with blockers of internalization [0.45 M sucrose and 0.25 mg/ml concanavalin A (Con A)]. Con A was removed after pretreatment, whereas sucrose was left during the stimulation with LTB4. Incubations were stopped by placing plates on ice and cells were washed twice with ice-cold Hanks' balanced salt solution, then immunostained with anti-Myc antibody at 4°C for 1 h, followed by incubation with fluorescein isothiocyanate (FITC)-conjugated goat anti-mouse antibody (BD Biosciences, Mississauga, ON, Canada) at 4°C for 1 h. Cells were collected, washed twice with 1× PBS, and then subjected to flow cytometry analysis. Acquisition and analysis were performed on a FACScan flow cytometer using CellQuest software (BD Biosciences). Inositol Phosphate Determination. COS-7 cells transfected with indicated cDNAs were labeled for 18 to 24 h with 3 μCi/ml myo-[3H]inositol in DMEM without inositol. The day of experiment, the cells were incubated in DMEM containing 0.1% bovine serum albumin and 20 mM LiCl for 10 min and then stimulated for 30 min with the 100 nM LTB4. The reactions were terminated by the addition of perchloric acid. Inositol phosphates were extracted and separated on Dowex AG1-X8 columns. Total labeled inositol phosphates were then counted by liquid scintillation counting. Functional Characterization of Mutant Receptors. To follow BLT1 internalization in real time and determine whether the C-tail plays a role in receptor internalization, BLT1-GFP and the C-tail–truncated BLT1-291-GFP were used in the current study. The Myc-tagged WT and G291stop BLT1 receptors have been described previously (Gaudreau et al., 2002). None of the cell lines (COS-7, HEK293, or RBL-2H3) used in this study expressed endogenous BLT1 or responded to LTB4 in terms of total inositol phosphate (IP) production. The binding affinity and IP production of BLT1-GFP and BLT1-291-GFP were compared with those of Myc-tagged WT BLT1 or BLT1–291 in transiently transfected COS-7 cells. The results revealed that both mutant receptors had an affinity for LTB4 comparable with that of WT (Table 1). As previously shown (Gaudreau et al., 2002), LTB4 induces a significant increase in IP accumulation in COS-7 cells transiently expressing WT or mutant BLT1 receptors and the Gα16 subunit (Fig. 1). IP accumulation represented a 4-fold increase over the basal levels (data not shown). Fusion of the GFP protein at the C-terminal end (BLT1-GFP) or immediately after residue G291 (BLT-291-GFP) of the receptor maintained effective, although partially decreased (66.1 ± 10.4% and 79.2 ± 3.7%, respectively) total IP production compared with Myc-BLT1 (defined as 100%) (Fig. 1). These constructs were used to study internalization of BLT1. Binding characteristics of WT and modified BLT1 receptors WT and mutant BLT1 receptors were transiently expressed in COS-7 cells and assayed for ligand binding as described under Materials and Methods. Dissociation constants (Kd) were calculated from competition binding curves, using GraphPad Prism version 3.0a. The results are presented as the means ± S.E.M. of at least three independent experiments, each done in triplicate. Effect of C-terminal addition of green fluorescent protein on WT and mutant BLT1 receptor signaling. COS-7 cells transiently coexpressing Myc-BLT1, BLT1-GFP, or BLT1-291-GFP mutant receptors together with Gα16 were tested for IP production in response to 100 nM LTB4 for 30 min. Values are means ± S.E.M. of three independent experiments, each done in duplicate. Data represent IP accumulation after LTB4 stimulation, above basal (nonstimulated) levels and are relative to levels obtained in cells expressing Myc-BLT1 (defined as 100%). Visualization of Cell-Type–Dependent Internalization of BLT1. To investigate the features of BLT1 internalization, either Myc-tagged BLT1 or BLT1-GFP was transiently expressed in RBL-2H3, HEK293, and COS-7 cells. We measured the amounts of endogenous GRK2 in these three types of cells by Western blotting and found them to be consistent with previously published findings (Barlic et al., 1999): RBL-2H3 cells expressed 5- to 10-fold higher levels of GRK2 than either HEK293 or COS-7 cells. Shown in Fig. 2A are confocal microscopy studies of Myc-tagged BLT1 localization in the three cell types exposed to the vehicle (i, iii, v) or 100 nM LTB4 (ii, iv, vi). In RBL-2H3 cells, LTB4-stimulated BLT1 internalized into the intracellular compartment in punctate vesicles (Fig. 2A, ii), in contrast to unstimulated cells in which BLT1 was only present at the cellular membrane (Fig. 2A, i). In LTB4-stimulated HEK293 and COS-7 cells, BLT1 remained localized at the cytoplasmic membrane (Fig. 2A, iv and vi), as seen in unstimulated cells (Fig. 2A, iii and v). Quantification of membrane versus cytosolic BLT1 expression is illustrated in Fig. 2B. Identical results were observed with BLT1-GFP (data not shown). These results indicate that BLT1 internalization was cell-type dependent, which may be the result of different levels of GRK2 expressed in these cells. BLT1 internalization in different cell types. RBL-2H3, HEK293, and COS-7 cells grown on coverslips were separately transfected with Myc-tagged BLT1 cDNA. Forty hours after transfection, cells were stimulated (St) (ii, iv, vi) or not (Ns) (i, iii, v) with 100 nM LTB4 for 30 min at 37°C, then immunostained with anti-Myc antibody followed by rhodamine-conjugated goat anti-mouse IgG as described under Materials and Methods. Images were acquired using confocal microscopy (A), and quantification of receptor internalization is illustrated in B.
Arrestin-Independent Internalization of BLT1. We have demonstrated previously that WT arrestin-2 or -3 could facilitate the internalization of platelet-activating factor receptor (PAFR), whereas DN arrestin-2 V53D and arrestin-3 V54D prevented PAFR internalization (Chen et al., 2002). To investigate whether arrestin-2 or -3 played a role in BLT1 internalization, the DN arrestins were coexpressed in RBL-2H3 cells with BLT1, and the WT counterparts were coexpressed with BLT1 in HEK293 and RBL-2H3 cells. The results in Fig. 3A, iii and iv, indicate that overexpressed DN arrestin-2 V53D did not impair BLT1 internalization in RBL-2H3 cells, and the overexpressed arrestin-2 did not promote BLT1 internalization in HEK293 cells (Fig. 3A, v and vi). Quantification of membrane versus cytosolic BLT1 expression is illustrated in Fig. 3B. Similar results were obtained with arrestin-3 (data not shown). Moreover, to define whether the inability of arrestins to affect BLT1 internalization was linked with a lack of association with BLT1, coimmunoprecipitation assays were performed in HEK293 cells and indicated that indeed arrestin-2 did not associate with BLT1 (Fig. 3C). As a control, under the same conditions, PAFR could coprecipitate arrestin-2. 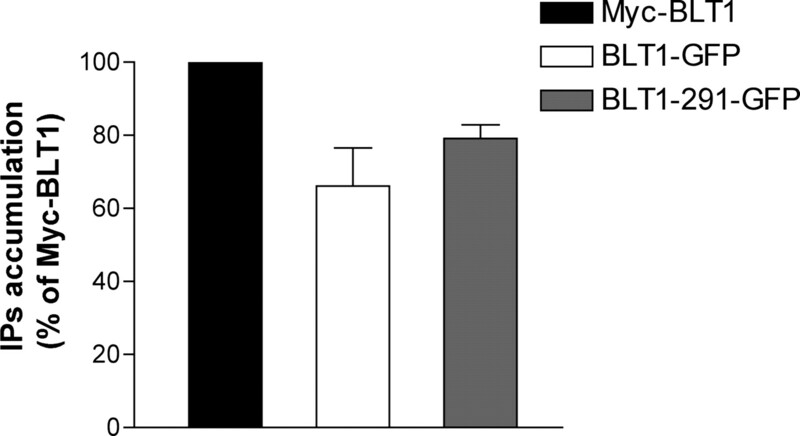 Effect of arrestins on BLT1 internalization. A, RBL-2H3 cells transiently coexpressing Myc-BLT1 and arrestin-2 or DN arrestin-2 V53D, or HEK293 cells transiently coexpressing Myc-BLT1 and arrestin-2, were stimulated (ii, iv, vi) or not (i, iii, v) with 100 nM LTB4 for 30 min at 37°C, then immunostained as described above. B, quantification of receptor internalization. RBL* denotes cotransfection with DN arrestin-2 V53D. C, HEK293 cells transiently coexpressing arrestin-2 with Myc-tagged PAFR or BLT1 were, respectively, stimulated with 100 nM PAF or LTB4 for 10 min at 37°C. Cells were harvested and lysed, and receptors were immunoprecipitated using anti-Myc antibodies and separated on SDS-PAGE gel. Coimmunoprecipitated arrestin proteins were revealed with anti-arrestin-2 antibody. Lower shows arrestin-2 content in total cell lysates. Equal amounts of protein content were applied to each lane of the gel. The results are representative of at least three independent experiments. To elucidate whether higher levels of GRKs were required for BLT1 to interact with arrestins, we coexpressed separately GRK2, GRK3, GRK5, or GRK6 with arrestin-2-GFP and Myc-tagged BLT1 in HEK293 cells. As observed in Fig. 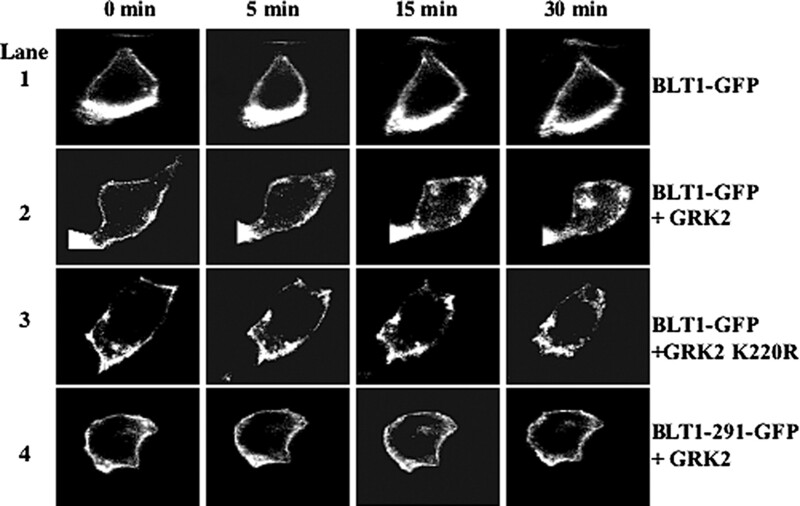 4, A and B, the level of arrestin-2-GFP was comparable in all cells. Moreover, Western blot analysis showed that all GRKs were adequately overexpressed compared with the pcDNA3 control (Fig. 4C). As shown in Fig. 4A, GRK2, -5, or -6 coexpression resulted in evident BLT1 internalization upon LTB4 stimulation; GRK2 had the most significant impact on receptor internalization. Overexpression of GRK3, however, was associated with only minimal BLT1 internalization. It was interesting that arrestin-2-GFP neither translocated to the plasma membrane nor colocalized with BLT1. Similar results were obtained with arrestin-3-GFP (data not shown). Again, a control experiment revealed that arrestin-2-GFP translocated to and colocalized with PAFR upon PAF stimulation (Fig. 4B). These results clearly show that BLT1 internalization was not dependent on arrestin translocation to and association with the receptor. However, the level of intracellular GRKs seemed to influence BLT1 sequestration. Effect of GRK overexpression on BLT1 internalization. A, HEK293 cells transiently transfected with Myc-BLT1, arrestin-2-GFP, and either GRK2, GRK3, GRK5, GRK6 cDNA or pcDNA3, were unstimulated (NS) or stimulated with 100 nM LTB4 for 30 min and immunostained as described above. B, as a positive control of internalization, cells coexpressing Myc-PAFR, arrestin-2-GFP, and GRK2 were stimulated with 100 nM PAF for 30 min at 37°C. BLT1 or PAFR are red and arrestin-2-GFP is green. Bright yellow color indicates colocalization of receptor and arrestin-2. 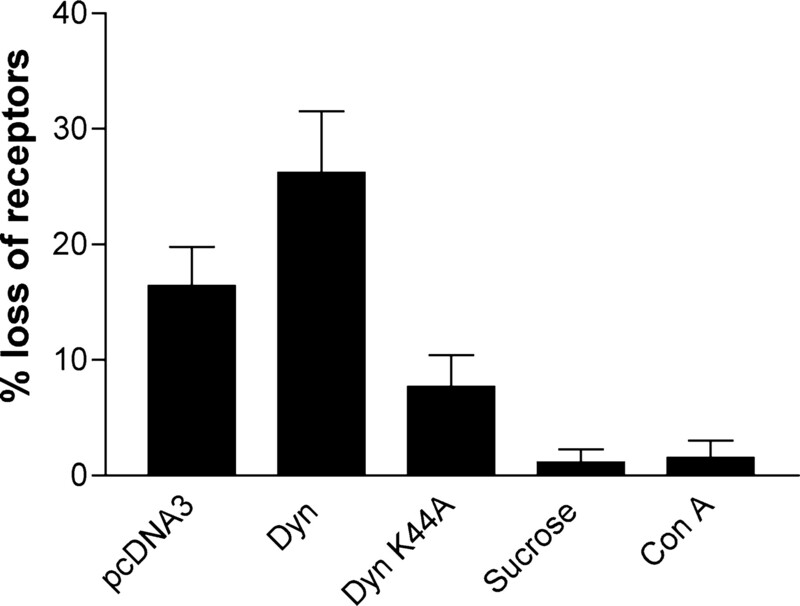 C, levels of expression of transfected GRKs versus pcDNA3 (p) controls, revealed by Western blotting of whole-cell lysates. GRK2* denotes the dominant-negative mutant K220R of GRK2, used in Fig. 5. GRK2-Dependent Internalization of BLT1. As shown in Fig. 4A, coexpression of BLT1 with GRK2 and arrestin-2-GFP resulted in BLT1 internalization and localization to intracellular vesicles in HEK293 cells. The next questions were whether GRK2 overexpression in the absence of arrestins was sufficient to cause or potentiate ligand-induced BLT1 internalization in HEK293 cells and whether the kinase inactive K220R mutant GRK2 could block the internalization of BLT1 in RBL-2H3 cells. As expected, overexpression of WT GRK2 alone promoted BLT1 internalization in HEK293 cells (Fig. 5A, i and ii), whereas the DN GRK2 K220R did not (Fig. 5A, iii and iv). It was interesting that this DN GRK2 completely blocked BLT1 endocytosis in RBL-2H3 cells (Fig. 5A, vii and viii), whereas overexpressed WT GRK2 had no additional effect on these cells. Quantification of data illustrated in Fig. 5A is presented in Fig. 5B. GRK2 requirement for BLT1 internalization. A, HEK293 and RBL-2H3 cells transiently coexpressing Myc-BLT1 with GRK2 or the DN GRK2 K220R, were stimulated (ii, iv, vi, viii) or not (i, iii, v, vii) with 100 nM LTB4 for 30 min at 37°C. Cells were immunostained and acquired as described above and under Materials and Methods. B, quantification of receptor internalization in the presence of cotransfected GRK2 or DN GRK2 K220R (DN). C, HEK293 cells were transiently cotransfected with Myc-BLT1 and either WT GRK2, DN GRK2 K220R cDNA, or pcDNA3 vectors. Forty hours after transfection, cells were stimulated for 30 min with 100 nM LTB4 at 37°C, immunostained with anti-Myc antibody, followed by FITC-conjugated goat anti-mouse IgG and analyzed by flow cytometry as described under Materials and Methods. D, coimmunoprecipitation assays were performed on HEK293 cells coexpressing GRK2 with Myc-tagged PAFR (lane 1), BLT1 (lane 2), or G291stop BLT1 (lane 3). Cells were stimulated with either 100 nM PAF or 100 nM LTB4 for 10 min at 37°C. Cells were then harvested and lysed, and receptors were immunoprecipitated using anti-Myc antibodies and separated on SDS-PAGE gel. Coimmunoprecipitated GRK2 proteins were revealed with anti-GRK2 antibody. Equal amounts of protein content were applied to each lane of the gel. The results are representative of at least three independent experiments. Using flow cytometry analysis (Fig. 5C), we further showed that GRK2-coexpression in HEK293 cells increased LTB4-induced BLT1 sequestration compared with the pcDNA3-transfected control cells (Fig. 5C). It is interesting that cells coexpressing BLT1 and GRK2 K220R showed no appreciable loss of cell surface BLT1 in response to LTB4. Coimmunoprecipitation studies revealed that GRK2 physically interacted with BLT1, as shown in Fig. 5D (lane 2). 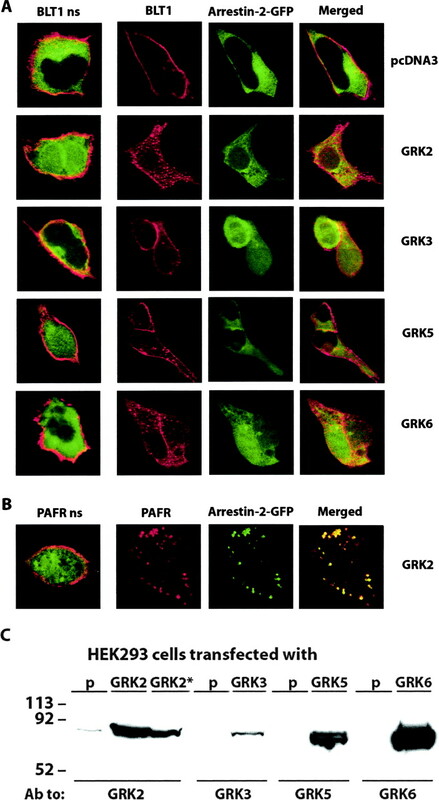 As a positive experimental control, PAFR also coprecipitated with GRK2 (Fig. 5D, lane 1). These results implied that BLT1 associated with GRK2 and required GRK2 kinase activity for its internalization. Role of BLT1 C Terminus in Receptor Internalization. Increasing evidence indicates the existence of several sites of interaction between the activated receptor and GRK, the kinase-targeted residues being the primary site of interaction (Pitcher et al., 1998). We have previously demonstrated with a C-tail truncated BLT1 (G291stop) that the cytoplasmic segment of BLT1 was essential for GRK-mediated receptor desensitization (Gaudreau et al., 2002). It is interesting that removal of BLT1 C-tail also prevented GRK2 coimmunoprecipitation (Fig. 5D, lane 3). Under real-time live cell confocal microscopy, BLT1-GFP internalization from the cytoplasmic membrane into intracellular vesicles was seen only in HEK293 cells overexpressing GRK2 (Fig. 6, lane 1 versus lane 2), which was consistent with the results from fixed cell confocal microscopy (Figs. 4A and 5A). Intracellular vesicles appeared as early as 15 min after agonist stimulation in cells that overexpressed GRK2. On the other hand, cells coexpressing BLT1-GFP and GRK2 K220R showed no vesicle formation but showed greater cell shape changes compared with cells expressing only BLT1-GFP (Fig. 6, lane 3 versus lane 1). Real-time visualization of BLT1 mobility in HEK293 cells. HEK293 cells were grown on coverslips and transiently cotransfected with BLT1-GFP (lanes 1–3) or BLT1-291-GFP (lane 4) with either pcDNA3 vectors (lane 1), GRK2 cDNA (lanes 2 and 4), or DN GRK2 K220R cDNA (lane 3). Forty hours after transfection, the coverslips were placed in a chamber that maintained the media at 37°C. Cells were stimulated with 100 nM LTB4, and images were acquired at time 0, 5, 15, and 30 min after stimulation. The results are representative of at least three independent experiments. Because G291stop BLT1 did not associate with GRK2, we further investigated the ability of the truncated mutant receptor to internalize in HEK293 coexpressing GRK2. Over a time-course study of 30 min in real-time confocal microscopy, we observed a drastically reduced sequestration of BLT1-291-GFP into intracellular vesicles in response to LTB4 (Fig. 6, lane 4). Using the Myc-tagged G291stop BLT1, we confirmed in RBL-2H3 cells (Fig. 7A, i and ii) and in HEK293 cells overexpressing GRK2 (Fig. 7A, iii and iv) that the C-tail was essential for BLT1 endocytosis. In addition, flow cytometry analysis of cell surface disappearance of the G291stop BLT1 in HEK293 cells showed that the truncated mutant receptor, in the presence of coexpressed GRK2, remained on the cell surface upon LTB4 exposure (Fig. 7B). These results indicate that BLT1 C-tail was required for receptor internalization and GRK2 association. Effect of C-tail truncation on BLT1 internalization. A, HEK293 and RBL-2H3 cells transiently expressing Myc-tagged G291stop BLT1 and GRK2 (HEK293 only) were stimulated or not with 100 nM LTB4 for 30 min at 37°C. Cells were immunostained with anti-Myc antibody followed by rhodamine-conjugated goat anti-mouse IgG antibodies as described under Materials and Methods. B, HEK293 cells, transiently cotransfected with Myc-tagged BLT1 or G291stop BLT1 and either GRK2 or pcDNA3, were stimulated with 300 nM LTB4 at 37°C for indicated times. Cells were immunostained using anti-Myc antibodies followed by FITC-conjugated goat anti-mouse IgG and analyzed by flow cytometry as described under Materials and Methods. The results are representative of three independent experiments, each done in duplicate. Clathrin and Dynamin Requirement for BLT1 Endocytosis. Clathrin-coated vesicle formation has been shown to require dynamin. We therefore investigated whether GRK2 promoted BLT1 receptor internalization through a dynamin- and clathrin-dependent mechanism. We measured BLT1 sequestration in HEK293 cells overexpressing GRK2 and dynamin (Dyn) 1A or its mutant form (Dyn K44A). In Fig. 8, we show that overexpression of Dyn enhanced BLT1 sequestration (60% increase), whereas the Dyn K44A DN had the inverse effect, inhibiting BLT1 sequestration (64% decrease). Moreover, prior treatment of cells with sucrose (0.45 M), as well as pretreatment with the lectin Con A, totally blocked cell surface disappearance of BLT1 receptors (95% decrease) (Fig. 8). These results suggest that GRK2 enhanced BLT1 endocytosis through clathrin-coated vesicles. Effect of internalization blockers on LTB4-induced BLT1 sequestration. HEK293 cells were transiently transfected with cDNAs encoding Myc-BLT1, GRK2 in combination with either the pcDNA3 expression vector (as control), dynamin 1A (Dyn), or its dominant-negative form Dyn K44A. Cells expressing BLT1 and GRK2 only were also pretreated or not for 20 min with the internalization blockers sucrose (0.45 M) or Con A (0.25 mg/ml). Cells were then stimulated with 300 nM LTB4 for 1 h then labeled as described above. Results represent the mean ± S.E.M. of at least three independent experiments done in duplicate. In the paradigm of GPCR internalization (which is, for a majority of GPCRs, dependent on GRK-mediated phosphorylation), the role of GRK is to facilitate arrestin binding to GPCRs and subsequent targeting of the receptors to the endocytotic machinery. However, a number of receptors do not follow this paradigm. In the present study, we demonstrate for the first time, using flow cytometry as well as real-time confocal microscopy, that agonist-induced BLT1 internalization requires GRK2 but not nonvisual arrestins. In addition, BLT1 C-tail plays a critical role in GRK2 association and receptor internalization. Our findings show that BLT1 internalization is dependent on cell phenotype. Cell type-dependence of GPCR internalization was previously observed with the CXCR1 receptor (Barlic et al., 1999), and we made similar observations with PAFR in RBL-2H3, HEK293, and COS-7 cells (Chen et al., 2002). Similar to CXCR1, BLT1 internalizes in RBL-2H3 cells, but not in HEK293 and COS-7 cells, as visualized by confocal microscopy. Differential cellular responses to distinct GPCR could be attributed to disparity in cellular contents of essential signaling components. Others and we have observed high levels of GRK2 in RBL-2H3 and low levels in HEK293 and COS-7 cells (Barlic et al., 1999; data not shown). CXCR1, PAFR, and BLT1 all internalize in RBL-2H3 cells. In HEK293 cells, however, CXCR1 internalization requires overexpression of both arrestin-2 and GRK2 (Barlic et al., 1999), whereas PAFR can internalize without arrestin overexpression, with arrestins only facilitating large vesicle formation (Chen et al., 2002). Our present findings show that BLT1 internalization needs coexpression of only GRK2, whereas overexpression of arrestins alone is unable to promote detectable BLT1 internalization. In COS-7 cells, PAFR internalization could be enhanced by coexpression of arrestins, with synergy between coexpressed arrestin-2 or -3 and GRK2 (Z. Chen and J. Staňková, unpublished data), whereas BLT1 did not appreciably internalize in COS-7 cells even with overexpression of arrestin-2 or -3. In all cell types, however, PAFR internalization was much more pronounced than BLT1 internalization. The disparate behavior of different GPCRs in the same cells could thus be attributed to their distinct structures and differential requirements for functional regulators. The potential physiological relevance of GRK2 expression levels was recently highlighted in a report by Vroon et al. (2004) showing that reduced GRK2 levels, as seen in lymphocytes from rheumatoid arthritis patients, are associated with enhanced responses to CCL4 in terms of chemotaxis and signaling. The dependence of GPCR internalization on arrestins is also evaluated by coexpression of their DN counterparts. By using this approach, BLT1 internalization was shown to be independent of arrestins because DN arrestin-2 V53D and arrestin-3 V54D did not block BLT1 internalization in RBL-2H3 cells. Furthermore, LTB4-induced BLT1 internalization was observed in absence of arrestin translocation, colocalization, and association with the receptor. According to these observations, BLT1 seems not to belong to either of these two classes of GPCRs proposed by Oakley et al. (2000), based on their affinities to arrestin-1, arrestin-2, and arrestin-3. Class A receptors, including the β2-AR, bind arrestin-3 with higher affinity than arrestin-2 and do not interact with visual arrestin-1. In contrast, class B receptors, including AT1AR, bind both nonvisual arrestin isoforms with similar high affinities and also interact with visual arrestin. Arrestin-independent endocytosis of GPCR has been described for the 5-hydroxytryptamine 2A receptor, N-formyl peptide receptor (FPR), angiotensin type 1A receptor (AT1AR), secretin receptor (SR), and M2 muscarinic receptor (Zhang et al., 1996; Pals-Rylaarsdam et al., 1997; Walker et al., 1999; Bennett et al., 2000; Bhatnagar et al., 2001). It is surprising that SR, AT1AR, and FPR are able to interact with arrestins to induce their translocation and colocalization, but receptor internalization is only dependent on phosphorylation and does not require arrestins (Walker et al., 1999; Zhang et al., 1999; Bennett et al., 2000; Oakley et al., 2000; Gilbert et al., 2001). Moreover, AT1AR, SR, and M2 muscarinic receptors were shown to internalize independently of the clathrin-coated pit (CCP) pathway (Zhang et al., 1996; Walker et al., 1999; Claing et al., 2000). In contrast, we showed that BLT1 endocytosis is CCP-dependent because it was enhanced by dynamin overexpression, blocked by DN Dyn-K44A as well as by the CCP internalization blockers sucrose and Con A.
Phosphorylation seems to be a prerequisite for desensitization and internalization of most GPCRs. In this study, we demonstrated that BLT1 internalization depended on functional GRK2. GRK2, which is abundantly expressed in human peripheral leukocytes (Chuang et al., 1992), may represent the main endogenous kinase responsible for BLT1 phosphorylation in neutrophils, somewhat eclipsing GRK5 or -6, which may also serve this function. Either GRK5 or -6 can potentiate BLT1 internalization in HEK293 cells. GRK2, however, may be preferred for phosphorylation of BLT1 and subsequent internalization, because the strongest internalization of BLT1 was seen in HEK293 cells coexpressing GRK2. We have observed previously that BLT1 desensitization occurred without exogenous GRK but was enhanced by GRK2, -5, or -6 expression in COS-7 cells (Gaudreau et al., 2002). Given that no appreciable BLT1 internalization was observed in COS-7 cells when GRK2 was not overexpressed (data not shown), we presume that BLT1 internalization may not be responsible for its desensitization. Some GPCRs have different requirements for GRK-mediated phosphorylation for their internalization. For instance, FSHR internalization is phosphorylation-independent (Nakamura et al., 1998). Overexpression of GRK2 enhances agonist-induced, glucose-dependent insulinotropic polypeptide receptor phosphorylation and desensitization, but receptor endocytosis is not affected by cotransfection with GRKs (Tseng and Zhang, 2000). GRK2 can phosphorylate and desensitize the SR, but GRK2 and arrestins can mediate receptor internalization only when protein kinase A is inhibited (Walker et al., 1999). β2-AR desensitization and internalization can be mediated by GRK2- and protein kinase A-mediated phosphorylation (Ferguson, 2001). As shown in this article, BLT1 seems to specifically require intact GRK2-kinase activity for its internalization, because the DN GRK2 K220R blocked BLT1 sequestration in RBL-2H3 cells. In addition, GRK5 and -6 can also promote BLT1 sequestration, albeit to a lesser extent, probably through phosphorylation of BLT1 C-tail serines and/or threonines. These and other structural determinants of BLT1 C-tail seem to play a role in GRK2 action. We defined the C terminus of BLT1 as a pivotal domain for receptor internalization and interaction with GRK2, which is also observed in other GPCRs (Premont et al., 1995). However, the mechanisms by which GRK2 promotes BLT1 internalization as well as the targeted structural determinants located in the C-tail remain to be clarified. One possibility could be that GRK2 phosphorylation reveals an AP-2 complex binding site and increases AP-2 interaction with BLT1, thus directing receptors to clathrin-coated vesicles. Dicker et al. (1999) have shown that the DN GRK2 K220R can physically associate with an activated parathyroid hormone receptor. This interaction was shown to be sufficient to disrupt receptor coupling to effector G proteins. To our knowledge, there is no clear evidence that GRK2 K220R can potentiate GPCR internalization. Herein, under real-time confocal microscopy, we showed that GRK2 K220R blocked BLT1 internalization but also changed BLT1-GFP mobility on the cellular membrane upon agonist exposure. This phenomenon may indicate that GRK2 K220R can associate with BLT1, as it can with the parathyroid hormone receptor, and enhance its mobility on the plasma membrane. However, this phenomenon did not represent receptor internalization because 1) no intracellular vesicles of BLT1 were formed in real-time live cells or fixed cells after LTB4 stimulation, 2) no receptor loss from the cell surface was detected by flow cytometry, and 3) BLT1 internalization was blocked in RBL-2H3 cells by GRK2 K220R. Another interesting question is why BLT1 did not promote arrestin translocation upon LTB4 activation. Increasing evidence suggests that receptor activation, conformation stability, and receptor phosphorylation are necessary to induce arrestin translocation and association to ligand-activated GPCRs. Recent studies also suggested that the conserved DRY sequence motif of CCR5 was necessary to promote arrestin interaction with the receptor (Huttenrauch et al., 2002). Moreover, the activated state of FPR was sufficient to allow arrestin translocation and association with the receptor, independently of the phosphorylation state (Bennett et al., 2000). BLT1 does not have a perfect DRY sequence motif in its second intracellular loop. It would therefore be interesting to determine whether the altered motif is responsible for the inability of the activated BLT1 to recruit arrestins. In addition, Bisello et al. (2002) showed that analogs of the parathyroid hormone-related protein stabilized the parathyroid hormone receptor in a conformation that initialized receptor signaling but not arrestin translocation, in contrast to the original hormone. In summary, the current study demonstrates, for the first time, that BLT1 internalization is cell type-dependent and requires functionally active GRK2, without the involvement of arrestins. Moreover, the C terminus of the receptor plays an important role in BLT1 internalization and association with GRK2. We acknowledge the excellent technical advice and collaboration of Denis Gingras and Sylvie Turcotte. We also thank Dr. Leonid Volkov for his dedication and his collaboration in confocal microscopy. This work was supported by grant MOP-49470 (to M.R.-P. and J.S.) from the Canadian Institutes of Health Research, a Studentship (to R.G.) from the Québec Fonds pour les Chercheurs et l'Aide à la Recherche (FCAR), and a Canada Research Chair in Inflammation (M.R.-P.). Z.C. and R.G. contributed equally to this work. ABBREVIATIONS: GPCR, G protein-coupled receptor; AR, adrenergic receptor; GRK, G protein-coupled receptor-specific kinases; LTB4, leukotriene B4; BLT1, leukotriene B4 receptor 1; FBS, fetal bovine serum; GFP, green fluorescent protein; HEK, human embryonic kidney; DMEM, Dulbecco's modified Eagle's medium; PBS, phosphate-buffered saline; PAGE, polyacrylamide gel electrophoresis; WT, wild type; Con A, concanavalin A; FITC, fluorescein isothiocyanate; IP, inositol phosphate; PAFR, platelet-activating factor receptor; PAF, platelet-activating factor; Dyn, dynamin; FPR, N-formyl peptide receptor; AT1AR, angiotensin type 1A receptor; SR, secretin receptor; CCP, clathrin-coated pit; DN, dominant negative. Barlic J, Khandaker MH, Mahon E, Andrews J, DeVries ME, Mitchell GB, Rahimpour R, Tan CM, Ferguson SS, and Kelvin DJ (1999) β-arrestins regulate interleukin-8-induced CXCR1 internalization. J Biol Chem 274: 16287-16294. Bennett TA, Maestas DC, and Prossnitz ER (2000) Arrestin binding to the G protein-coupled N-formyl peptide receptor is regulated by the conserved “DRY” sequence. J Biol Chem 275: 24590-24594. Bhatnagar A, Willins DL, Gray JA, Woods J, Benovic JL, and Roth BL (2001) The dynamin-dependent, arrestin-independent internalization of 5-hydroxytryptamine 2A (5-HT2A) serotonin receptors reveals differential sorting of arrestins and 5-HT2A receptors during endocytosis. J Biol Chem 276: 8269-8277. Bisello A, Chorev M, Rosenblatt M, Monticelli L, Mierke DF, and Ferrari SL (2002) Selective ligand-induced stabilization of active and desensitized parathyroid hormone type 1 receptor conformations. J Biol Chem 277: 38524-38530. Borgeat P and Samuelsson B (1979) Transformation of arachidonic acid by rabbit polymorphonuclear leukocytes. Formation of a novel dihydroxyeicosatetraenoic acid. J Biol Chem 254: 2643-2646. Bray MA, Ford-Hutchinson AW, and Smith MJ (1981) Leukotriene B4: an inflammatory mediator in vivo. Prostaglandins 22: 213-222. Chen Z, Dupre DJ, Le Gouill C, Rola-Pleszczynski M, and Stankova J (2002) Agonist-induced internalization of the platelet-activating factor receptor is dependent on arrestins but independent of G-protein activation. Role of the C terminus and the (D/N)PXXY motif. J Biol Chem 277: 7356-7362. Chuang TT, Sallese M, Ambrosini G, Parruti G, and De Blasi A (1992) High expression of β-adrenergic receptor kinase in human peripheral blood leukocytes. Isoproterenol and platelet activating factor can induce kinase translocation. J Biol Chem 267: 6886-6892. Claing A, Perry SJ, Achiriloaie M, Walker JKL, Albanesi JP, Lefkowitz RJ, and Premont RT (2000) Multiple endocytic pathways of G-protein-coupled receptors delineated by GIT1 sensitivity. Proc Natl Acad Sci USA 97: 1119-1124. Crooks SW and Stockley RA (1998) Leukotriene B4. Int J Biochem Cell Biol 30: 173-178. Dicker F, Quitterer U, Winstel R, Honold K, and Lohse MJ (1999) Phosphorylation-independent inhibition of parathyroid hormone receptor signaling by G protein-coupled receptor kinases. Proc Natl Acad Sci USA 96: 5476-5481. Fels AO, Pawlowski NA, Cramer EB, King TK, Cohn ZA, and Scott WA (1982) Human alveolar macrophages produce leukotriene B4. Proc Natl Acad Sci USA 79: 7866-7870. Ford-Hutchinson AW, Bray MA, Doig MV, Shipley ME, and Smith MJ (1980) Leukotriene B, a potent chemokinetic and aggregating substance released from polymorphonuclear leukocytes. Nature (Lond) 286: 264-265. Gaudreau R, Le Gouill C, Venne MH, Stankova J and Rola-Pleszczynski M (2002) Threonine 308 within a putative casein kinase 2 site of the cytoplasmic tail of leukotriene B4 receptor (BLT1) is crucial for ligand-induced, G-protein-coupled receptor-specific kinase 6-mediated desensitization. J Biol Chem 277: 31567-31576. Gilbert TL, Bennett TA, Maestas DC, Cimino DF, and Prossnitz ER (2001) Internalization of the human N-formyl peptide and C5a chemoattractant receptors occurs via clathrin-independent mechanisms. Biochemistry 40: 3467-3475. Goldman DW and Goetzl EJ (1984) Heterogeneity of human polymorphonuclear leukocyte receptors for leukotriene B4. Identification of a subset of high affinity receptors that transduce the chemotactic response. J Exp Med 159: 1027-1041. Huttenrauch F, Nitzki A, Lin FT, Honing S, and Oppermann M (2002) β-arrestin binding to CC chemokine receptor 5 requires multiple C-terminal receptor phosphorylation sites and involves a conserved Asp-Arg-Tyr sequence motif. J Biol Chem 277: 30769-30777. Laporte SA, Oakley RH, Holt JA, Barak LS, and Caron MG (2000) The interaction of β-arrestin with the AP-2 adaptor is required for the clustering of β2-adrenergic receptor into clathrin-coated pits. J Biol Chem 275: 23120-23126. McDonald PP, McColl SR, Naccache PH, and Borgeat P (1992) Activation of the human neutrophil 5-lipoxygenase by leukotriene B4. Br J Pharmacol 107: 226-232. Molski TF, Naccache PH, Borgeat P and Sha'afi RI (1981) Similarities in the mechanisms by which formyl-methionyl-leucyl-phenylalanine, arachidonic acid, and leukotriene B4 increase calcium and sodium influxes in rabbit neutrophils. Biochem Biophys Res Commun 103: 227-232. Nakamura K, Krupnick JG, Benovic JL, and Ascoli M (1998) Signaling and phosphorylation-impaired mutants of the rat follitropin receptor reveal an activation- and phosphorylation-independent but arrestin-dependent pathway for internalization. J Biol Chem 273: 24346-24354. Oakley RH, Laporte SA, Holt JA, Caron MG, and Barak LS (2000) Differential affinities of visual arrestin, β-arrestin1 and β-arrestin2 for G protein-coupled receptors delineate two major classes of receptors. J Biol Chem 275: 17201-17210. Palmblad J, Malmsten CL, Uden AM, Radmark O, Engstedt L, and Samuelsson B (1981) Leukotriene B4 is a potent and stereospecific stimulator of neutrophil chemotaxis and adherence. Blood 58: 658-661. Pals-Rylaarsdam R, Gurevich VV, Lee KB, Ptasienski JA, Benovic JL, and Hosey MM (1997) Internalization of the m2 muscarinic acetylcholine receptor: arrestin-independent and -dependent pathways. J Biol Chem 272: 23682-23689. Pitcher JA, Freedman NJ, and Lefkowitz RJ (1998) G protein-coupled receptor kinases. Annu Rev Biochem 67: 653-692. Pitcher JA, Hall RA, Daaka Y, Zhang J, Ferguson SS, Hester S, Miller S, Caron MG, Lefkowitz RJ, and Barak LS (1998) The G protein-coupled receptor kinase 2 is a microtubule-associated protein kinase that phosphorylates tubulin. J Biol Chem 273: 12316-12324. Premont RT, Inglese J, and Lefkowitz RJ (1995) Protein kinases that phosphorylate activated G protein-coupled receptors. FASEB J 9: 175-182. Rola-Pleszczynski M and Stankova J (1992) Leukotriene B4 enhances interleukin-6 (IL-6) production and IL-6 messenger RNA accumulation in human monocytes in vitro: transcriptional and posttranscriptional mechanisms. Blood 80: 1004-1011. Showell HJ, Naccache PH, Borgeat P, Picard S, Vallerand P, Becker EL and Sha'afi RI (1982) Characterization of the secretory activity of leukotriene B4 toward rabbit neutrophils. J Immunol 128: 811-816. Tseng CC and Zhang XY (2000) Role of G protein-coupled receptor kinases in glucose-dependent insulinotropic polypeptide receptor signaling. Endocrinology 141: 947-952. Vroon A, Heijnen CJ, Lombardi MS, Cobelens PM, Mayor F Jr, Caron MG, and Kavelaars A (2004) Reduced GRK2 level in T cells potentiates chemotaxis and signaling in response to CCL4. J Leukoc Biol 75: 901-909. Walker JK, Premont RT, Barak LS, Caron MG, and Shetzline MA (1999) Properties of secretin receptor internalization differ from those of the β2-adrenergic receptor. J Biol Chem 274: 31515-31523. Yokomizo T, Izumi T, Chang K, Takuwa Y, and Shimizu T (1997) A G-protein-coupled receptor for leukotriene B4 that mediates chemotaxis. Nature (Lond) 387: 620-624. Yokomizo T, Kato K, Hagiya H, Izumi T, and Shimizu T (2001) Hydroxyeicosanoids bind to and activate the low affinity leukotriene B4 receptor, BLT2. J Biol Chem 276: 12454-12459. Yokomizo T, Kato K, Terawaki K, Izumi T, and Shimizu T (2000) A second leukotriene B4 receptor, BLT2. A new therapeutic target in inflammation and immunological disorders. J Exp Med 192: 421-432. Yu SS, Lefkowitz RJ, and Hausdorff WP (1993) β-adrenergic receptor sequestration. A potential mechanism of receptor resensitization. J Biol Chem 268: 337-341. Zhang J, Barak LS, Anborgh PH, Laporte SA, Caron MG, and Ferguson SS (1999) Cellular trafficking of G protein-coupled receptor/β-arrestin endocytic complexes. J Biol Chem 274: 10999-11006. Zhang J, Ferguson SS, Barak LS, Menard L, and Caron MG (1996) Dynamin and β-arrestin reveal distinct mechanisms for G protein-coupled receptor internalization. J Biol Chem 271: 18302-18305.